Shepherd Youth Football is a charitable organization founded in 2014 to promote youth football in Shepherd, Michigan to further the development of leadership, character, sportsmanship, tolerance, discipline, and athletic ability; to nurture youth fitness, volunteerism, and a lifelong love of sports; and to serve as the feeder system to the Shepherd High School Bluejay’s football program. In the fall of 2017, Shepherd Youth Football decided to begin an endowment fund that will provide scholarships to Shepherd High School graduates who have participated in high school football. In selecting the most qualified applicant to receive the scholarship each year, reviewers will give preference to those who participated in Shepherd Youth Football, received the Warrior and/or Iron Man Award, have distinguished achievement in football and have demonstrated financial need. 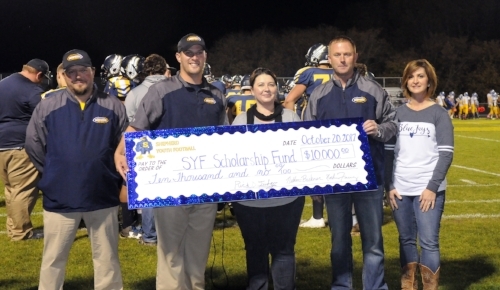 The Board of Shepherd Youth Football presented a symbolic check to start the Scholarship Fund during the high school’s last home football game in October, 2017. Student shall be planning to enroll at an accredited college, university or trade school. Student participated in Shepherd Youth Football. Student received the Warrior Award and/or Iron Man Award. Student has distinguished achievement in football (All-Area, All-Conference, or All-State recognition, team captain or other team award), as expressed in the applicant’s written essay. Student has demonstrated financial need, as expressed in the applicant’s written essay. This fund is currently growing and will award scholarships in the future.